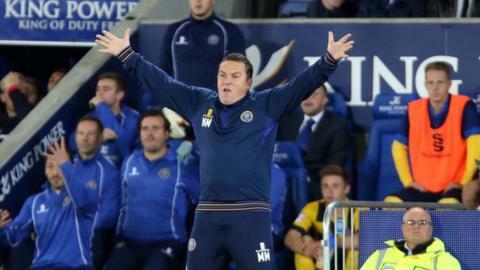 Shrewsbury Town manager Micky Mellon blamed his side's busy start to the new season for Tuesday night's Johnstone's Paint Trophy defeat at Preston. A "scrappy" second-half goal from Jordan Hugill at Deepdale proved enough to cause Town's fourth successive first-round exit from the competition. "That zip and that zest that's been so very clear over the last few weeks just wasn't there," he told BBC Shropshire. "If we're honest it looked a game too many for a few of the lads." Town's 1-0 defeat was their first loss in eight matches under Mellon - an uplifting run that has seen them rise to fourth in League Two, as well as reach the League Cup third round, thanks to wins over Championship side Blackpool and Premier League outfit Leicester City. Having played successive Saturday-Tuesday matches since the season began on 9 August, Mellon made four changes to the team that had beaten League Two promotion hopefuls Luton Town 2-0 on Saturday, bringing in defender Mark Ellis, striker Jean-Louis Akpa Akpro, new signing Anthony Griffith and fellow midfielder James Caton. Conor Goldson was relegated to the bench, along with James Wesolowski, James Collins and Scott Vernon (who all came on after Town had gone 1-0 down), while top scorer Andy Mangan remains sidelined with the hamstring injury he suffered in scoring the winner at Leicester. "We just lacked that wee bit of cleverness to get you a goal," added Mellon. "There wasn't much between the two teams. "It was just a grind-out. And it was always going to be a scrappy goal that settled it. "We had players that needed to play and I'm pleased they've got that under their belt. "But we're disappointed to be out. We obviously wanted to win. We want to win every game we play. And the next game is Saturday at Hartlepool, so we now have to turn our attention to that."